60 HOURS OF CONTINUOUS SHOW WITH THE BEST ENTERTAINERS FROM NYC AND AROUND THE WORLD. PRE-EVENT PARTY STARTS AT 5:15 PM ON THU, JAN 1 WITH START OF SHOW AT 7PM AND ENDING SUN, JAN 4 AT 7AM. New York’s Metropolitan Room will shock the entertainment world with an unprecedented, pull-out-the-stops programming initiative to kick off 2015. For three days -- Thursday January 1 at 7pm to Sunday January 4 at 7am -- the intimate concert venue will stage its first “Marathon Variety Show,” with continuous entertainment for 60 hours straight. This is an official Guinness World Record-eligible event. The marathon, which is eligible to become a Guinness World Records record-holder for longest variety show ever, will feature over 235 Metropolitan Room performers -- from its most prominent stars to its most promising emerging talents. We are going to celebrate the range of shows at the Metropolitan Room and program the best and most original… it’s this impressive mix that makes our club truly one of a kind. 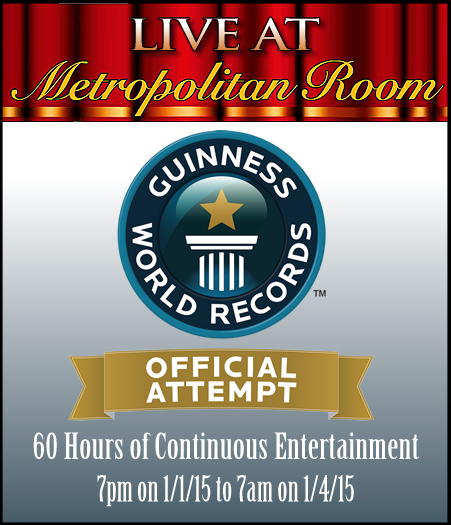 Starting at 7pm on Thursday January 1 and playing continuously for 60 hours until 7am on Sunday January 4, the Metropolitan Room’s “Marathon Variety Show” will feature full and partial sets by a non-stop procession of talents. Webcast for a worldwide audience, the marathon will also feature several comedians, magicians, novelty performers and masters of ceremony who will make sure that the entertainment is continuous, with absolutely no breaks, giving new meaning to the adage “the show must go on!” Complimentary breakfast will be served on Saturday and Sunday mornings. Customers who attend the longest -- either for unbroken stretches of time or for combined attendance recorded over three days by the club’s reservationists -- will win special prizes and be entered in the official record of the event. Sleeping will not be permitted in the showroom.